Strix sp. 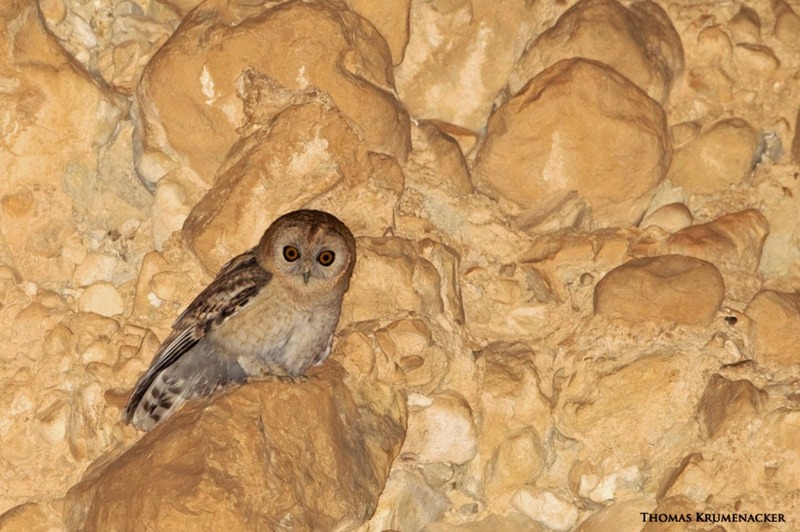 in the Judean desert of Israel, probably the Desert Tawny Owl (Strix hadorami). Genetic and morphological analyses revealed that the type specimen of Hume’s Owl Strix butleri, the geographical provenance of which is open to doubt, differs significantly from all other specimens previously ascribed to this species. 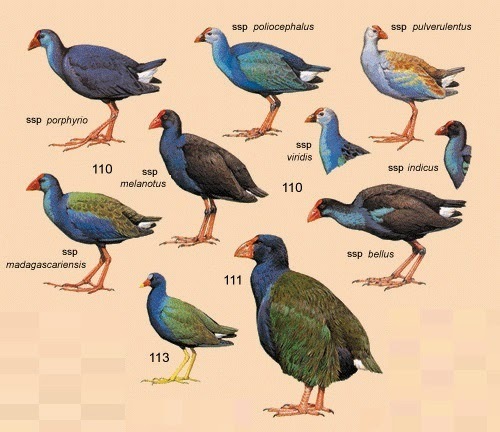 Despite the absence of vocal data definitively linked to the same population as the type specimen, we consider that two species-level taxa are involved, principally because the degree of molecular differentiation is close to that seen in other taxa of Strix traditionally recognised as species. Partially complicating this otherwise straightforward issue is the recent description of “Omani Owl S. omanensis” from northern Oman based solely on photographs and sound-recordings. We consider that there is clear evidence of at least some morphological congruence between the butleri type and the phenotype described as “omanensis”. 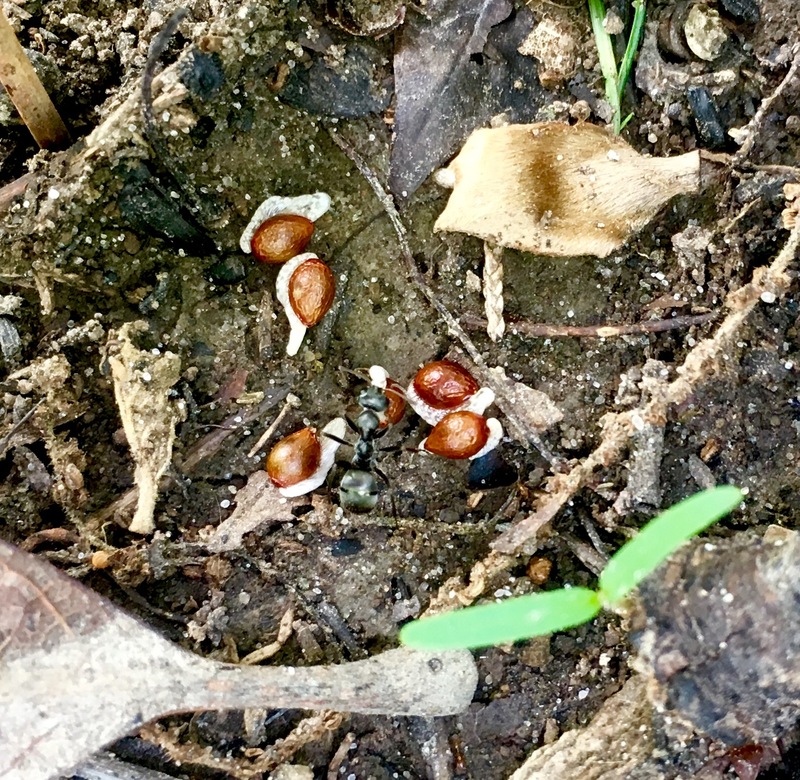 As a result, we review the relative likelihood of three potential hypotheses: that “omanensis” is a synonym of butleri; that “omanensis” is a subspecies of butleri; or that “omanensis” and butleri both represent species taxa. Until such time as specimen material of “omanensis” becomes available for genetic and comparative morphological analyses, we recommend that this name be considered as a synonym of butleri, especially bearing in mind the possibility (not previously considered in detail) that the type of butleri could have originated in Arabia, specifically from Oman. We describe other populations heretofore ascribed to S. butleri as a new species. Guy M Kirwan, Manuel Schweizer and José Luis Copete. 2015. Multiple Lines of Evidence confirm that Hume’s Owl Strix butleri (A. O. Hume, 1878) is Two Species, with Description of An Unnamed Species (Aves: Non-Passeriformes: Strigidae). 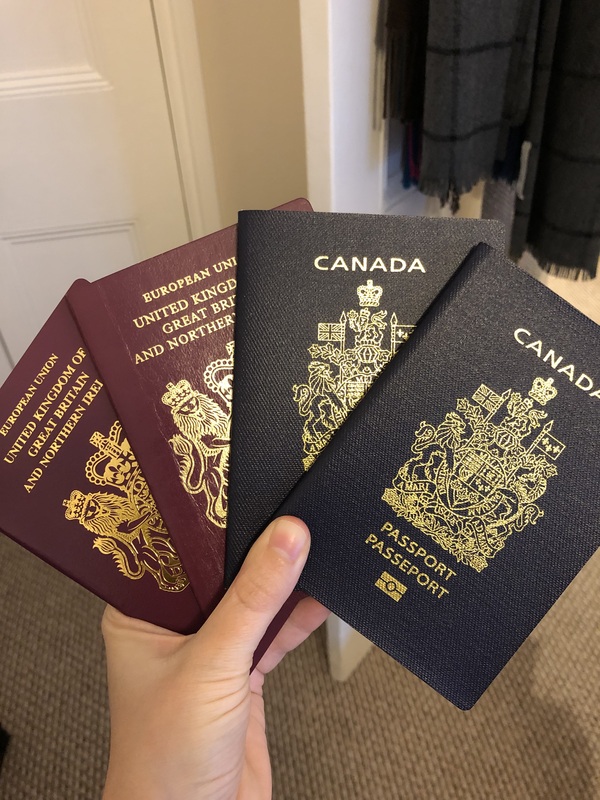 Saudi Arabia, Jordan, Oman and Yemen. Type and Only Known Species: Qijianglong guokr, sp. nov.
Etymology: Qijiang, after Qijiang District where the type specimen was collected and is accessioned; ‘long,’ dragon in Chinese. 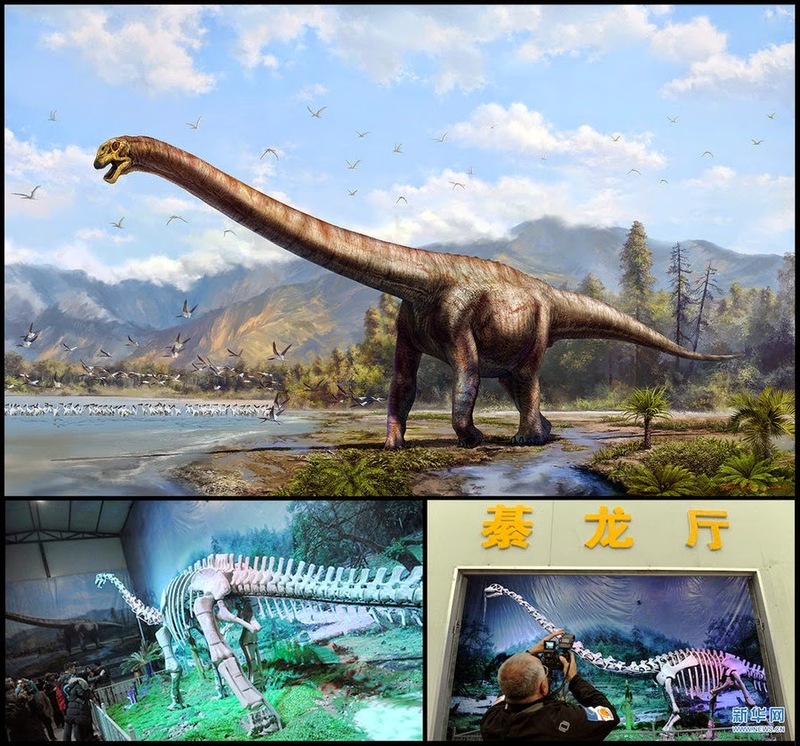 guokr (gu-OH-ke-r), named in honor of Guokr (science social network; ‘nutshell’ in Chinese) for their support of paleontology in Qijiang. Ancient snakes: (top left) Portugalophis lignites (Upper Jurassic) in a gingko tree, from coal swamp deposits at Guimarota, Portugal; (top right) Diablophis gilmorei (Upper Jurassic), hiding in a ceratosaur skull, from the Morrison Formation in Fruita, Colorado; (bottom) Parviraptor estesi (Upper Jurassic/Lower Cretaceous) swimming in freshwater lake with snails and algae, from the Purbeck Limestone in Swanage, England. 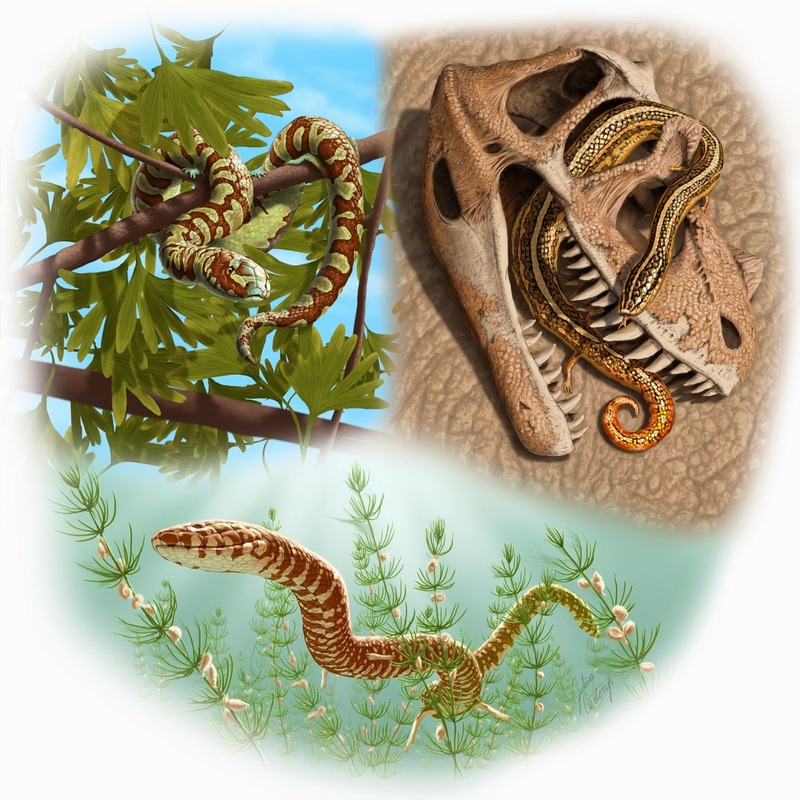 The previous oldest known fossil snakes date from ~100 million year old sediments (Upper Cretaceous) and are both morphologically and phylogenetically diverse, indicating that snakes underwent a much earlier origin and adaptive radiation. We report here on snake fossils that extend the record backwards in time by an additional ~70 million years (Middle Jurassic-Lower Cretaceous). These ancient snakes share features with fossil and modern snakes (for example, recurved teeth with labial and lingual carinae, long toothed suborbital ramus of maxillae) and with lizards (for example, pronounced subdental shelf/gutter). 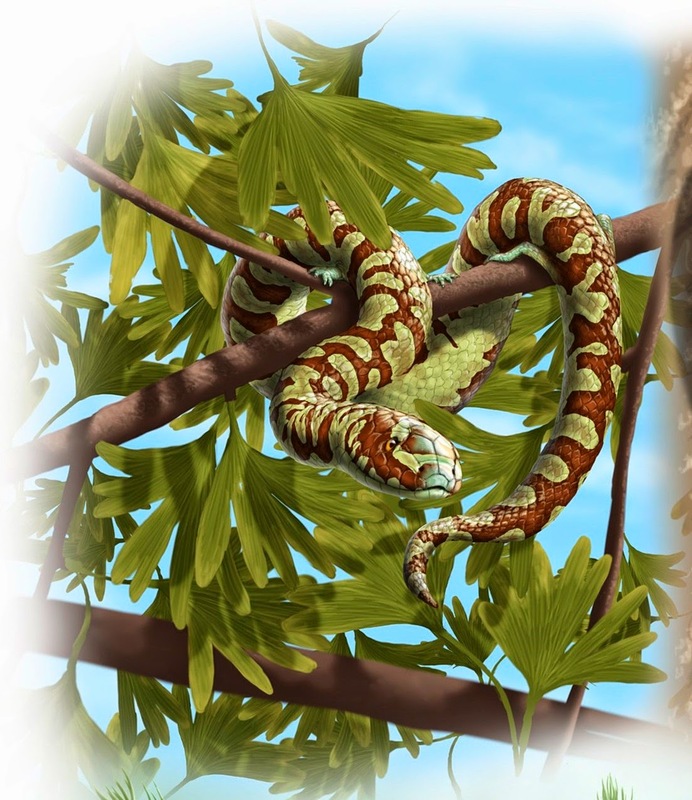 The paleobiogeography of these early snakes is diverse and complex, suggesting that snakes had undergone habitat differentiation and geographic radiation by the mid-Jurassic. Phylogenetic analysis of squamates recovers these early snakes in a basal polytomy with other fossil and modern snakes, where Najash rionegrina is sister to this clade. Ingroup analysis finds them in a basal position to all other snakes including Najash. Michael W. Caldwell, Randall L. Nydam, Alessandro Palci and Sebastián Apesteguía. 2015. 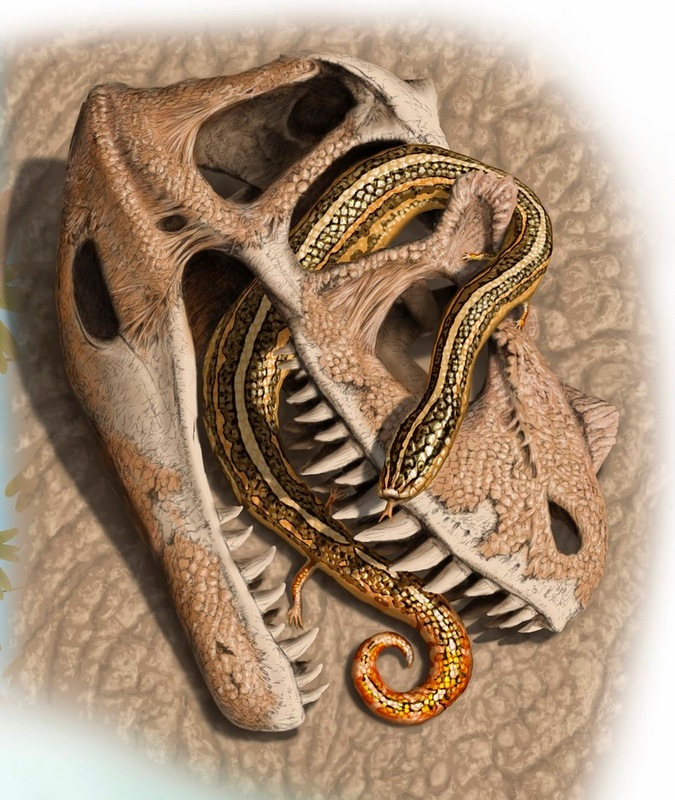 The Oldest Known Snakes from the Middle Jurassic-Lower Cretaceous provide insights on Snake Evolution. Nature Communications. 6. DOI: 10.1038/ncomms6996. A, right dentary in medial view; B, right pterygoid in ventral view; C, mid-cervical vertebrae in lateral view; D, mid-dorsal vertebrae in lateral view; E, articulated paramedian osteoderms in dorsal view; F, sacrum in ventral view; G, right femur in anterolateral view; H, left fibula in lateral view; I, left astragalus in anterior view; J, left calcaneum in proximal view; K, left first metatarsal in dorsal view; L, left pubis in lateral view; M, left humerus in posterior view. Scale bars equal 1 cm for individual elements and 50 cm for entire skeleton. 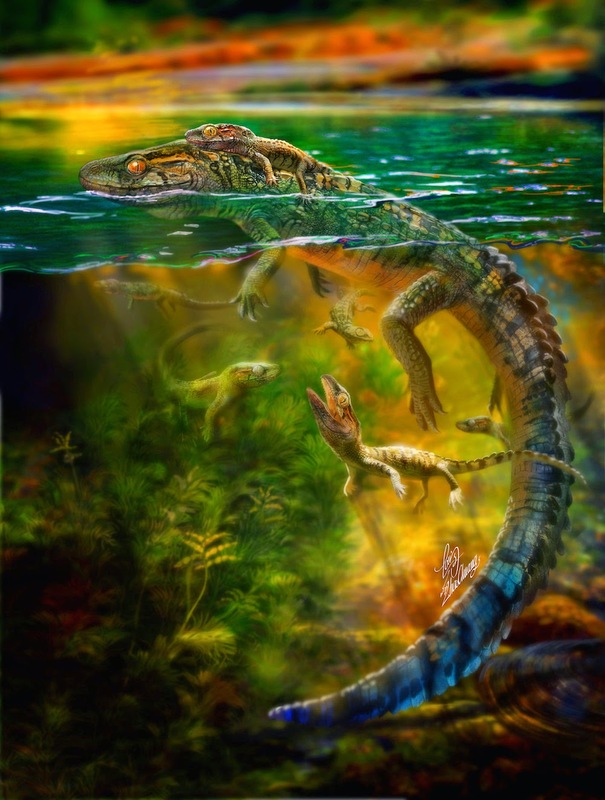 The presence of early pseudosuchians and avemetatarsalians in Anisian beds of Africa demonstrates that the archosaur radiation was well underway by the beginning of the Middle Triassic. 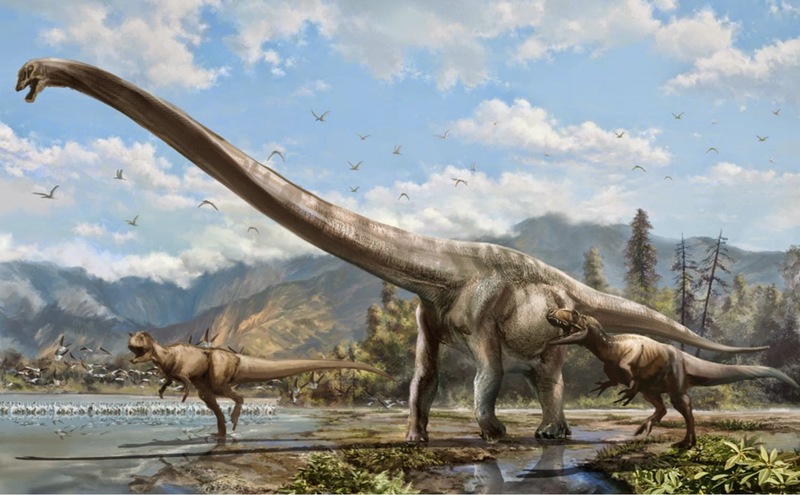 The rapid radiation produced a variety of forms, but many of the unique, well-diagnosed Late Triassic clades (e.g., Aetosauria, Ornithosuchidae) lack diagnosable members from the Middle Triassic. Here, we introduce a new Middle Triassic archosaur, Nundasuchus songeaensis, gen. et sp. nov., with an unusual mix of apomorphic character states found within Pseudosuchia and just outside Archosauria. 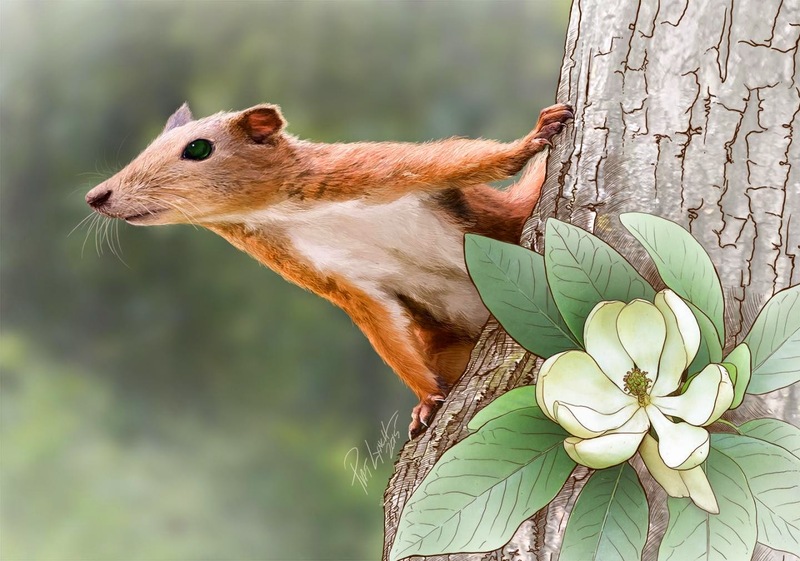 The holotype consists of partial skeleton, including representative postcranial elements and parts of the skull. We added Nundasuchus songeaensis, gen. et sp. nov., into the two most comprehensive early archosaur phylogenetic data sets available, and in both analyses the new taxon falls within Pseudosuchia. However, a number of plesiomorphic archosaurian character states (e.g., posterolaterally directed tuber of the calcaneum) optimize as local autapomorphies of the new taxon within Pseudosuchia in our analyses. Therefore, we tested alternative hypotheses of relationships for the new taxon by utilizing constraint trees. The analyses resulted in little change in the relationships and structure of other Triassic archosaur clades, but changed optimizations of certain character states and character support at the base of Pseudosuchia and Archosauria. Our analyses suggest that the complex evolution of character-state changes at the base of Archosauria is inhibiting our understanding of the relationships of early Pseudosuchia and, in turn, Archosauria. NUNDASUCHUS SONGEAENSIS, gen. et sp. 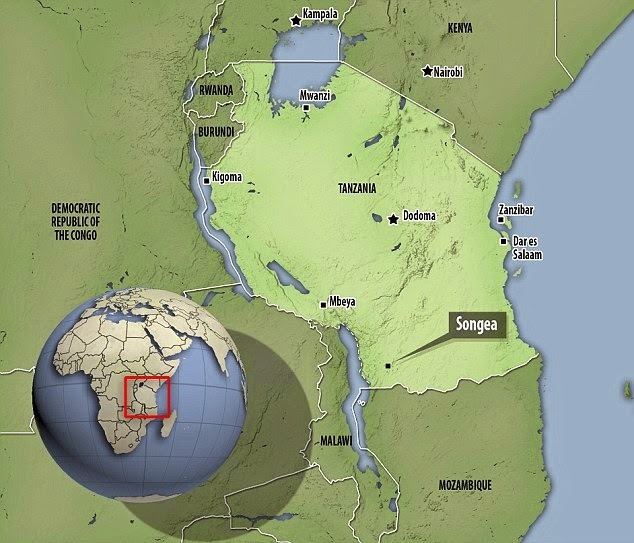 nov.
Etymology: ‘Nunda’ predator (Swahili); ‘soukhos’ crocodile (Greek); the species name recognizes the nearby provincial capital of Songea. Tupinambis merianae, is a large, omnivorous tegu lizard native to South America. Two populations of tegus are established in the state of Florida, USA, but impacts to native species are poorly documented. During summer 2013, we placed automated cameras overlooking one American alligator (Alligator mississippiensis) nest, which also contained a clutch of Florida red-bellied cooter (Pseudemys nelsoni) eggs, and one American crocodile (Crocodylus acutus) nest at a site in southeastern Florida where tegus are established. We documented tegu activity and predation on alligator and turtle eggs at the alligator nest, and tegu activity at the crocodile nest. 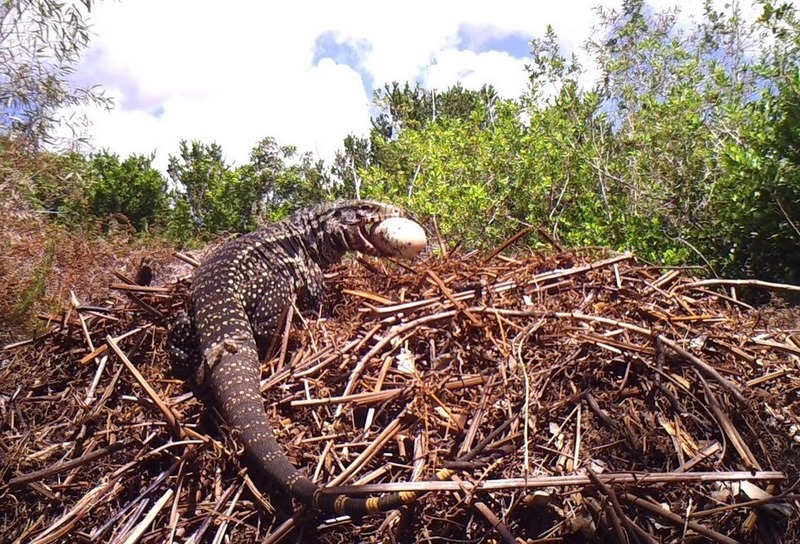 Our finding that one of the first two crocodilian nests to be monitored was depredated by tegus suggests that tegus should be further evaluated as a threat to nesting reptiles in Florida. Frank J. Mazzotti, Michelle McEachern, Mike Rochford, Robert N. Reed, Jennifer Ketterlin Eckles, Joy Vinci, Jake Edwards, Joseph Wasilewski. 2015. Tupinambis merianae as Nest Predators of Crocodilians and Turtles in Florida, USA. 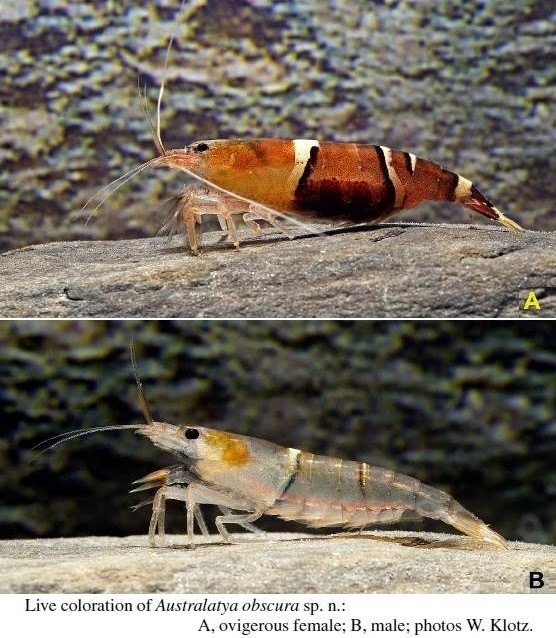 Dario huli, new species, is described from a small tributary stream of the Tunga River in southern Karnataka, India. It can be distinguished from all its congeners except D. urops by the presence of a conspicuous black caudal-fin blotch and by anterior dorsal-fin lappets in males not being produced beyond fin spines. 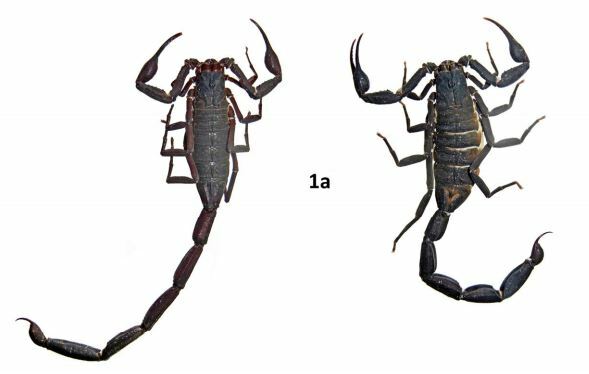 It is readily distinguished from Dario urops by the absence of the horizontal suborbital stripe (vs. presence), the presence of a series of up to eight black bars on the body (vs. 2–3 black bars restricted to caudal peduncle), 25 scales in a lateral row (vs. 28), 3–5 tubed lateral-line scales (vs. tubed lateral-line scales completely absent), 13+13=26 vertebrae (vs. 14+14–15=28-29), and the presence of teeth on hypobranchial 3 (vs. absence of teeth). 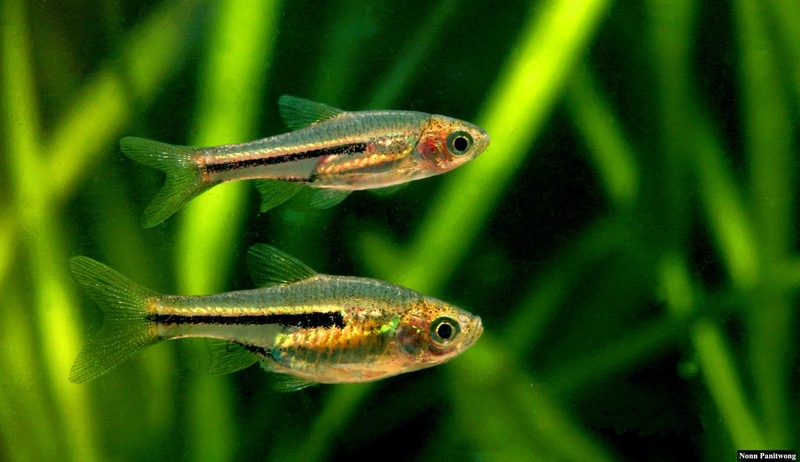 Post-natal parental care seems to have evolved numerous times in vertebrates. Among extant amniotes, it is present in crocodilians, birds, and mammals. 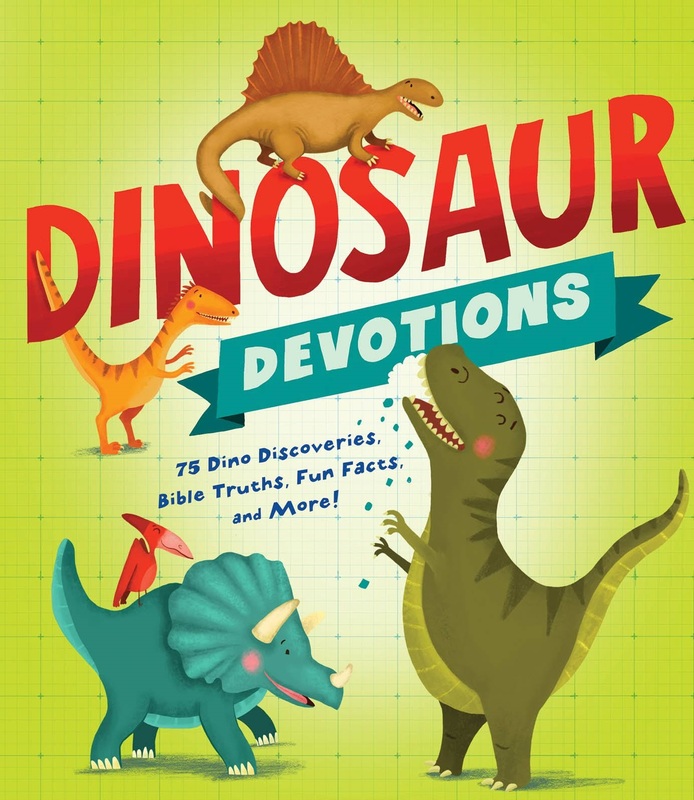 However, evidence of this behavior is extremely rare in the fossil record and is only reported for two types of dinosaurs, and a varanopid ‘pelycosaur’. 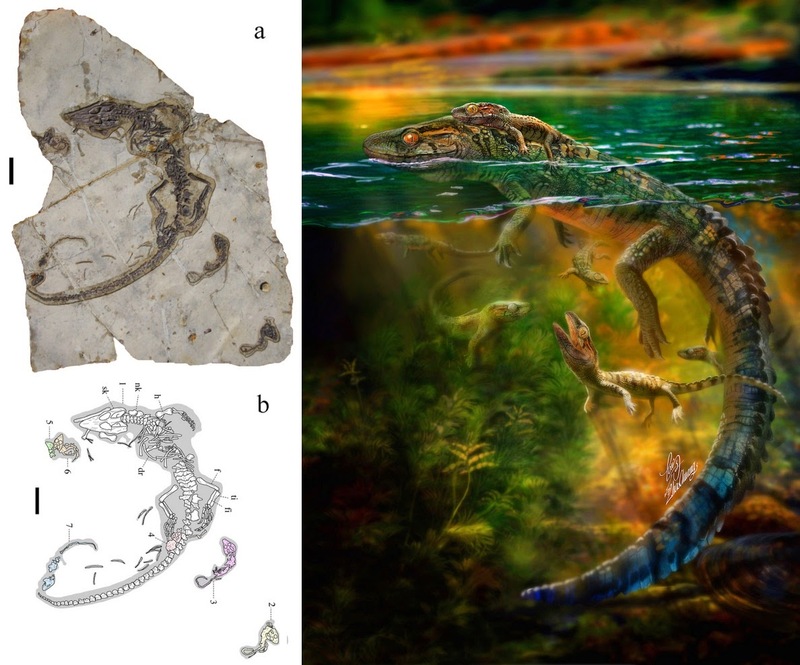 Here we report new evidence for post-natal parental care in Philydrosaurus, a choristodere, from the Yixian Formation of western Liaoning Province, China. We review the fossil record of reproduction in choristoderes, and this represents the oldest record of post-natal parental care in diapsids to our knowledge. Fig. 1. Photograph (a) and line drawings (b) of Philydrosaurus (JPM-10-088). 1: adult; 2‒7: juveniles (see text for diagnosis). Abbreviations: dr – dorsal rib; f – femur; fi – fibula; h – humerus; nk – neck; sk – skull; ti – tibia. Grey areas were exposed during its preparation, demonstrating that all skeletons are from a single horizon. Scale bar = 5 cm. Junchang Lü, Yoshitsugu Kobayashi, D. Charles Deeming and Yongqing Liu. 2014. Post-natal Parental Care in A Cretaceous Diapsid from northeastern China. 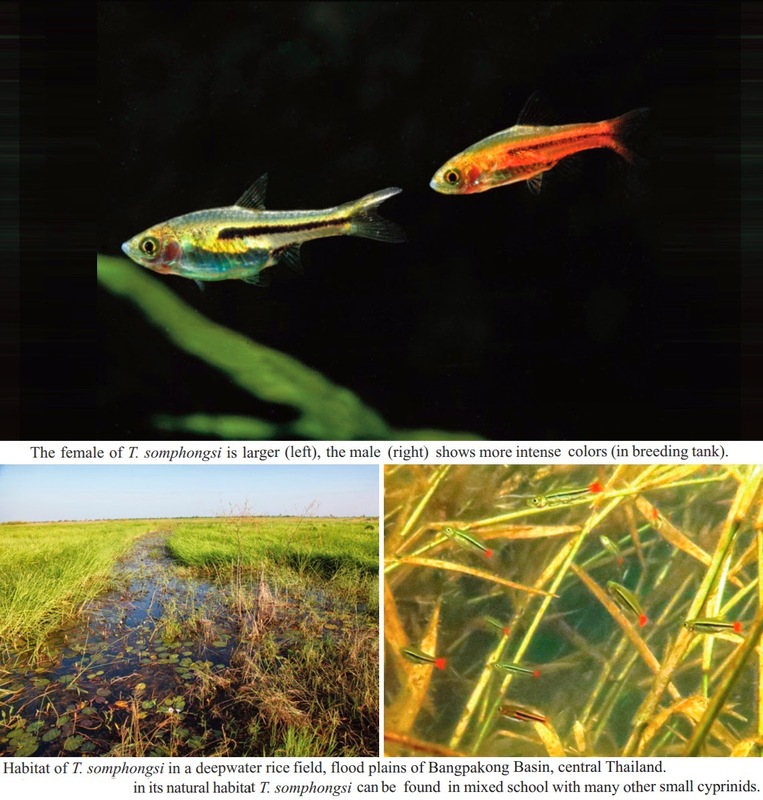 A population of a critically endangered Trigonostigma somphongsi (Meinken, 1958) has been discovered in a deepwater rice field, floodplain of Bangpakong Basin, Nakhon Nayok Province, central Thailand. 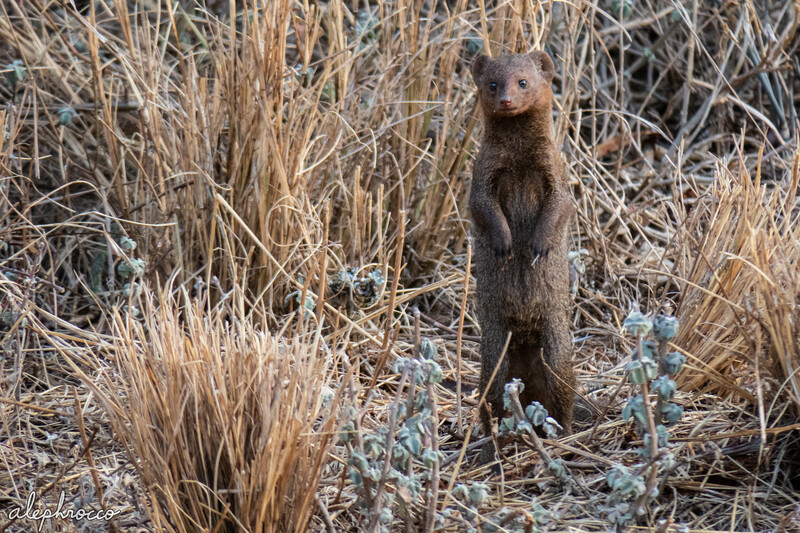 The population was the first record of this species in its natural habitat since its description by Meinken in 1958. 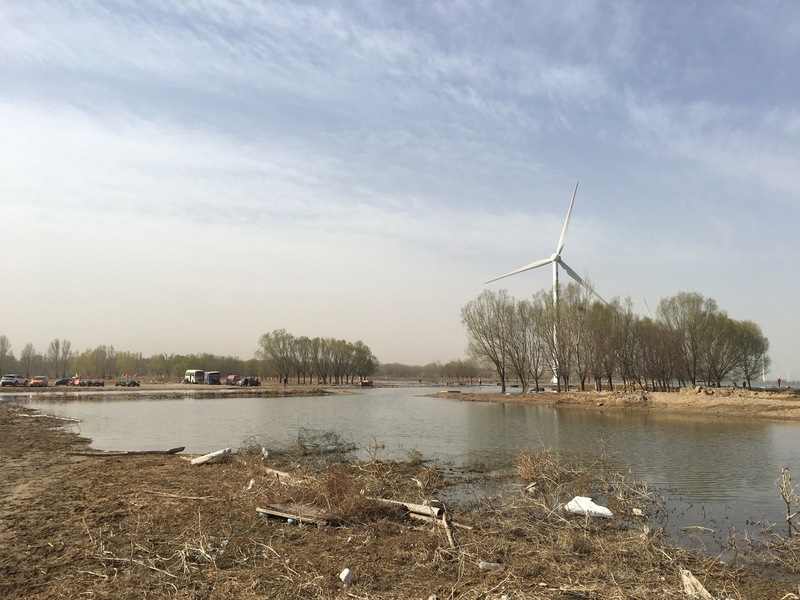 The species appeared to be a seasonal horizontal migration species, since it migrates to breed in the floodplain during the rainy season between July and November and migrates back into the main channel during the dry season. KEY WORDS: Trigonostigma somphongsi; Cyprinidae; Bangpakong; Thailand. Nidsaraporn Petsut, Nonn Panitvong, Sitthi Kulabtong, Jirawaeth Petsut & Chirachai Nonpayon. 2014. The First Record of Trigonostigma somphongsi (Meinken, 1958), A Critically Endangered Species, in its Natural Habitat of Thailand. Baillie J.E.M. and Butcher E.R., 2012. Priceless or Worthless ? : The World’s Most Threatened Species. Zoological Society of London, 112 pp. 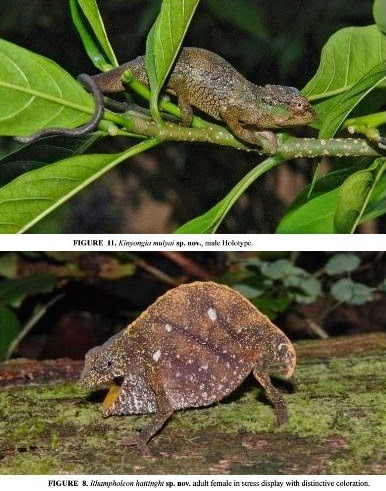 The bufonid genus Adenomus, an endemic of the montane and lowland rainforests of central and south-western Sri Lanka, has been considered to comprise of three species, viz. A. kelaartii, A. dasi and A. kandianus, the last of which has been recently highlighted as " the world's rarest toad " . We conducted a survey across the known range of Adenomus and used multiple criteria to delineate species boundaries within the genus. 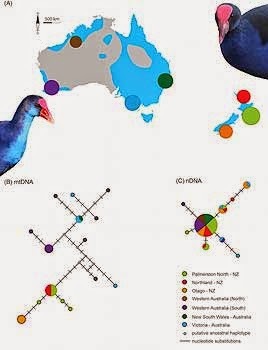 These include: a molecular phylogeny based on a 16S ribosomal RNA gene fragment; an examination of the external morphology of adults and larvae, and the skeletal morphol-ogy of adults; a bioacoustic analysis; and ecological niche modelling. 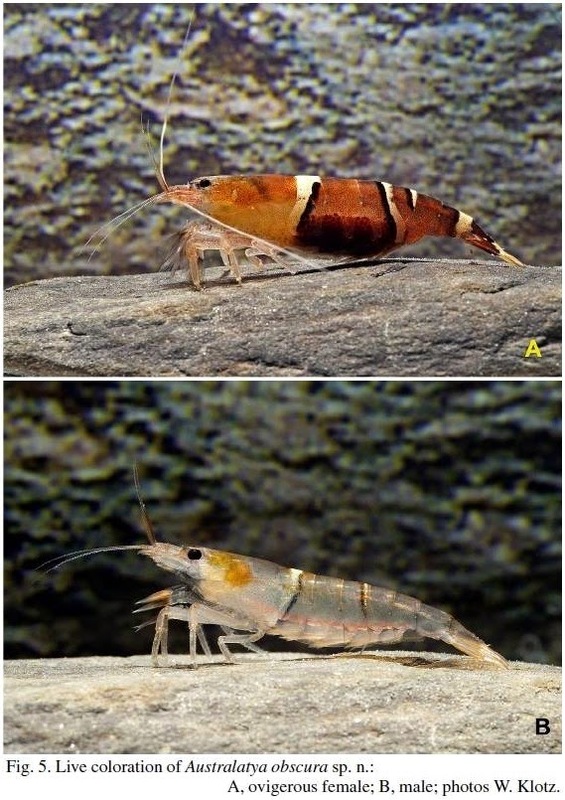 We show that Adenomus is monophyletic and that it comprises only two species: A. kelaartii and A. kandianus, with A. dasi being a junior synonym of the latter. For the two valid species of Adenomus, we provide detailed osteological descriptions; clarify the distribution patterns; and provide genetic data to facilitate their scientific conservation management. 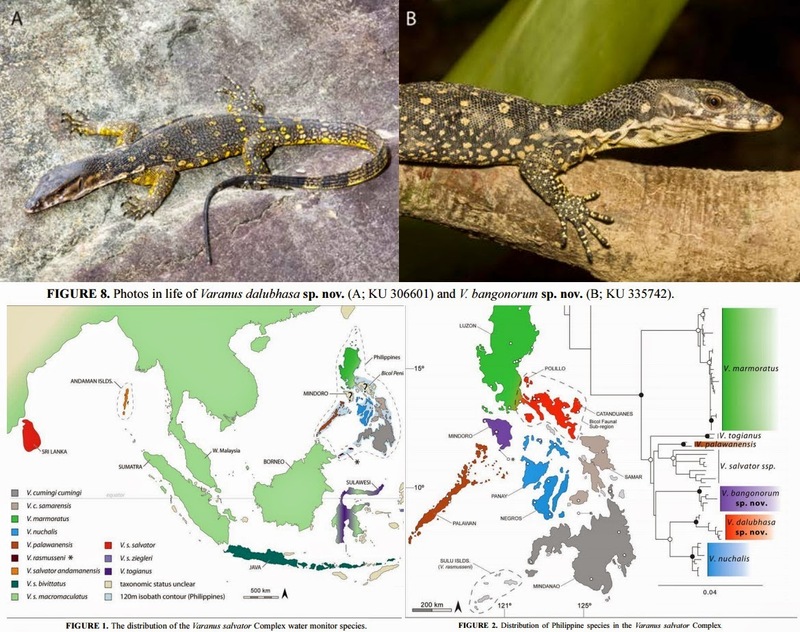 We describe a new lowland forest-dwelling Cyrtodactylus from Suk Samran District, Ranong Province, southern peninsular Thailand, having a blotched dorsal pattern, a continuous series of poreless enlarged femoral and precloacal scales, 18–20 regularly arranged dorsal tubercle rows, no precloacal groove, no transversely enlarged subcaudal plates and a maximal known snout-vent length of 59.6 mm. Cyrtodactylus ranongensis sp. nov. seems closely related to C. quadrivirgatus, but is readily distinguished from it by having 35–40 ventral scale rows, a reddish iris, heavy dorsal mottling, and lacking longitudinal dark-brown elements in its dorsal pattern. 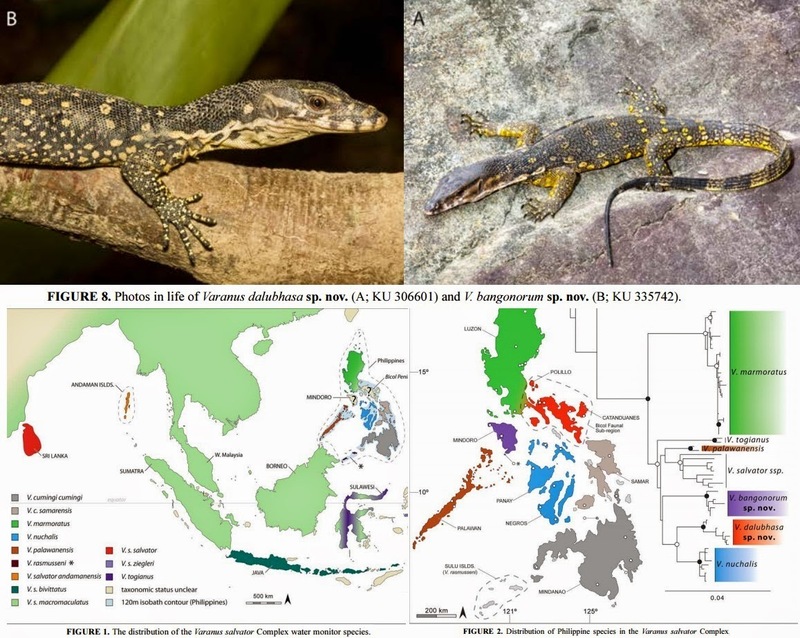 Keywords: Thai-Malay Peninsula, Ranong, Cyrtodactylus ranongensis sp. nov.
from Ranong Province, peninsular Thailand. 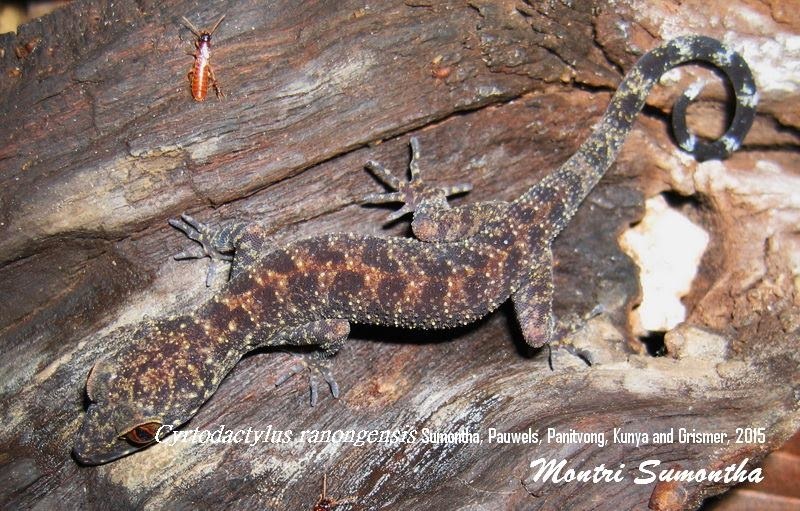 We describe a new forest-dwelling Cyrtodactylus from Doi Inthanon, Chiang Mai Province, northern Thailand. Cyrtodactylus inthanon sp. nov. is characterized by a maximum known SVL of 87.3 mm; 18 to 20 longitudinal rows of dorsal tubercles; a continuous series of 34 to 37 enlarged femoro-precloacal scales, including four to six pitted (female) or porebearing (male) scales on each femur separated by a diastema from five pitted (females) or pore-bearing (male) precloacal scales; no precloacal groove or depression; transversely enlarged subcaudal scales; and three to five irregular beige dorsal bands between limb insertions. 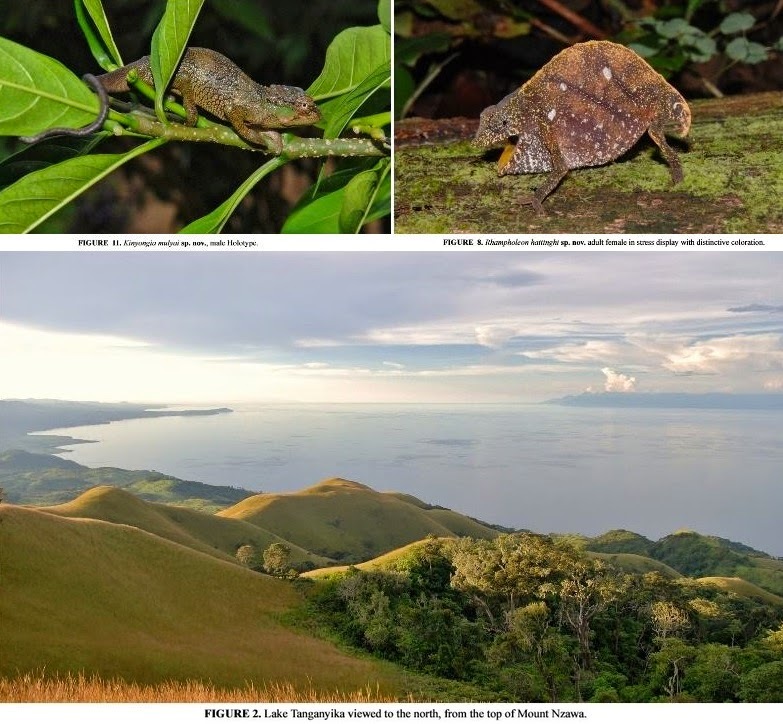 The discovery of a new reptile endemic to Doi Inthanon reinforces the high importance of this mountain in terms of biodiversity conservation. Distribution and natural history. The species is known only from Doi Inthanon, from 700 to 1010 m a.s.l., where it is common. We encountered it while it was active at night on trees and large rocks along streams. It moved slowly when disturbed by torch light and bit when handled. 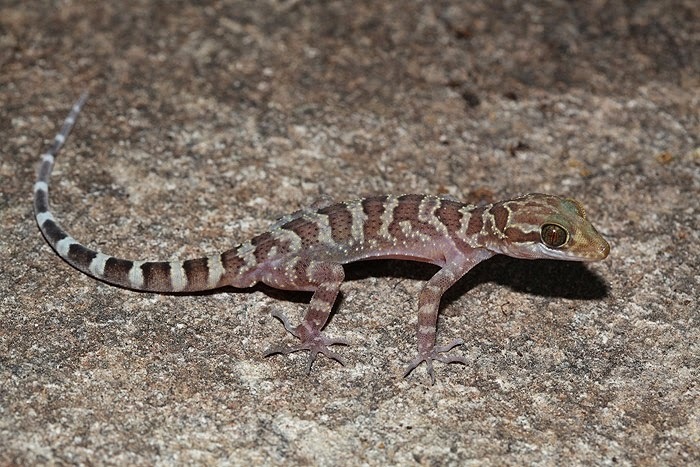 It was found at direct proximity to the reptiles Acanthosaura lepidogaster (Cuvier) (Agamidae), Gekko gecko (Linnaeus), Hemidactylus frenatus Duméril & Bibron and H. platyurus (Schneider), Hemiphyllodactylus chiangmaiensis Grismer, Wood & Cota (Gekkonidae), Ahaetulla prasina (Boie) (Colubridae), Amphiesma khasiense (Boulenger) (Natricidae) and Trimeresurus popeiorum Smith (Viperidae), and the amphibians Ansonia inthanon Matsui, Nabhitabhata & Panha (Bufonidae), Leptolalax pelodytoides (Boulenger), Megophrys major Boulenger and M. minor Stejneger (Megophryidae), Amolops marmoratus (Blyth), Hylarana nigrovittata (Blyth) and Odorrana livida (Blyth) (Ranidae). Captive specimens ate meal worms and crickets and seemed to quickly dehydrate with decreasing hygrometry. The new species’ known range entirely falls within Doi Inthanon National Park. Etymology. The specific epithet inthanon refers to the type locality. It is a noun in apposition, invariable. We suggest the following common names: ตุ๊กกายดอยอินทนนท์ 'Took-kai Doi Inthanon' (Thai), Doi Inthanon bent-toed gecko (English), Cyrtodactyle du Doï Inthanon (French), Doi Inthanon Bogenfingergecko (German), Doiinthanonkromvingergekko (Dutch). Dearcmhara shawcrossi gen. et sp. nov.
Etymology. Dearcmhara, Scottish Gaelic for ‘marine lizard’; shawcrossi, in honour of Brian Shawcross, who collected the specimens and magnanimously donated them to a museum collection instead of retaining them in private hands. In English phonology Dearcmhara is pronounced as ‘jark vara’ (IPA for Scottish English Phonology: d͡ʒɐrk vɐrɐ). Note that in other English phonologies the open vowel (i.e. ‘a’) can be pronounced differently, and the alveolar trill (‘rolled r’) is the alveolar approximant (ɹ). Stephen L. Brusatte, Mark T. Young, Thomas J. Challands, Neil D. L. Clark, Valentin Fischer, Nicholas C. Fraser, Jeff J. Liston, Colin C. J. MacFadyen, Dugald A. Ross, Stig Walsh and Mark Wilkinson. 2015. 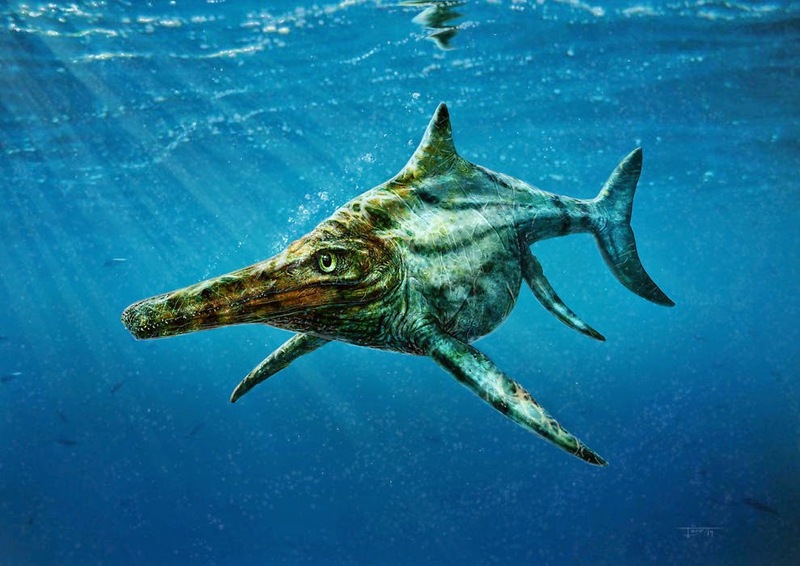 Ichthyosaurs from the Jurassic of Skye, Scotland. Scottish Journal of Geology. In this study, we report for the first time a hybridization between Caretta caretta and Chelonia mydas in South Korea. On 7th May 2012, a sea turtle (Jeju sea turtle 01, JST01) was found in the east coast of Jeju Island, South Korea. 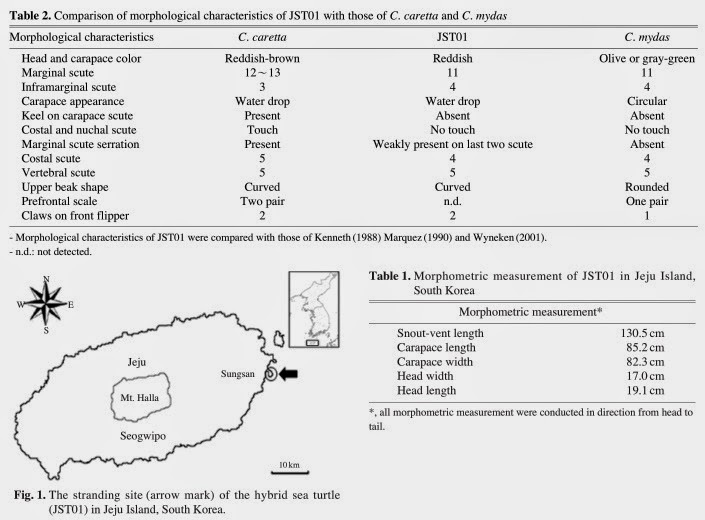 The morphological characteristics of JST01 were compared with those of C. caretta and C. mydas that were frequently observed in Korean Seas. Interestingly, JST01 showed similar morphological characters such as body color, appearance of carapace, shape of upper beak, serration on marginal scute, and two claws with those of C. caretta. On the other hand, JST01 showed also similar patterns in several characteristics including the numbers of marginal, inframarginal and costal scute, smooth carapace without keel, no contact between costal scute and nuchal scute with those of C. mydas. From these results, we suggest that JST01 is one of hybrid animals bred between C. caretta and C. mydas, because JST01 has species specific characters from both species. We anticipate that our study would be useful and have significant impact onto study inter-specific hybridization in the groups of sea turtle. The Green Turtle (Chelonia mydas) principally occupies tropical and subtropical waters, although juveniles are known to occur seasonally in temperate coastal waters. 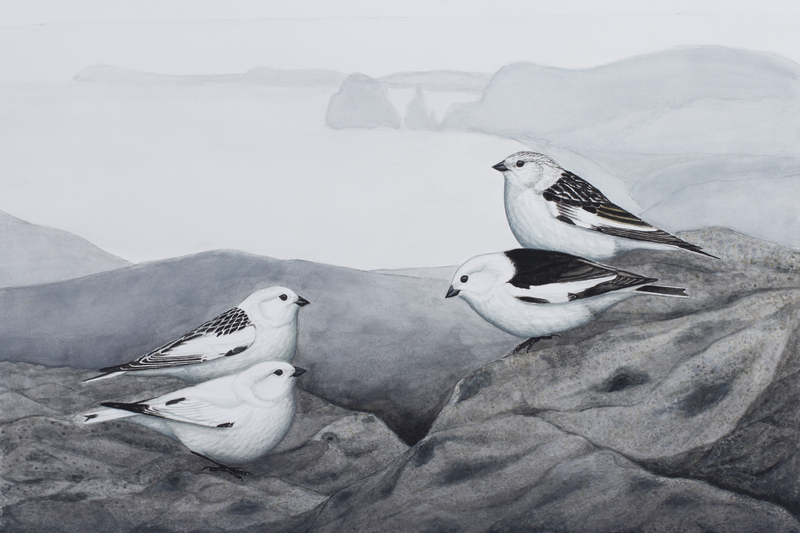 Collaboration with commercial fishers in eastern Canada yielded the most northerly records of this species in the northwest Atlantic. 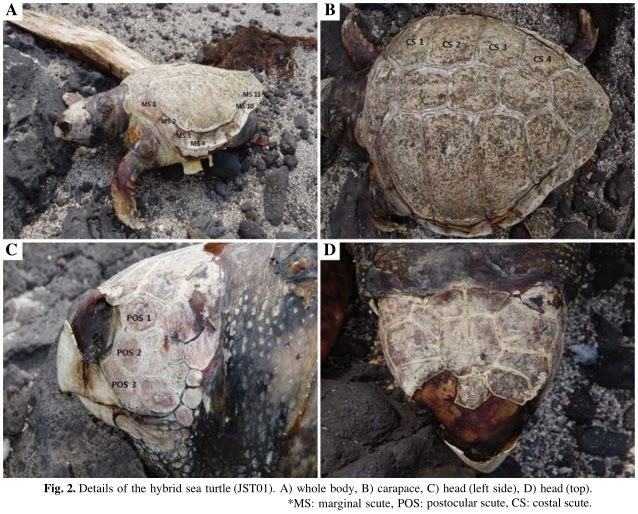 Here we report on the first confirmed record of a Green Turtle in eastern Canada and on the occurrence of a rare Green Turtle–Loggerhead Turtle (Caretta caretta) hybrid. Hybridization between the Carettini and Chelonini is extraordinary given that these groups have been genetically distinct for 50 million years or more. Key Words: Green turtle, Chelonia mydas, hybrid, Loggerhead Turtle, Caretta caretta, Atlantic Canada. 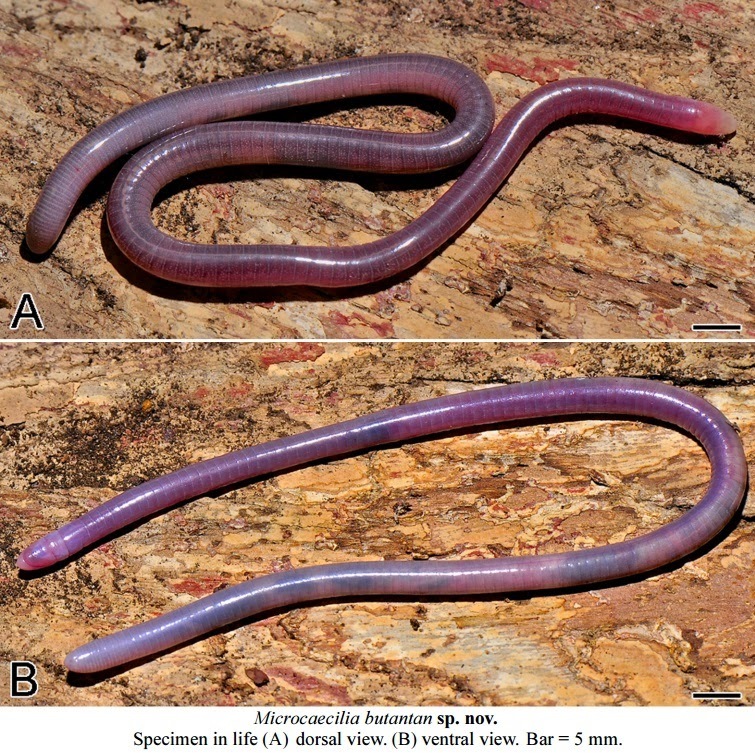 A new species of siphonopid caecilian, Microcaecilia butantan sp. nov., is described based on four specimens from Belterra, in the State of Pará, Brazil. The new species differs from all other Microcaecilia in having a combination of more than 135 primary annuli and long premaxillary-maxillary tooth series that extend posteriorly beyond the choanae. 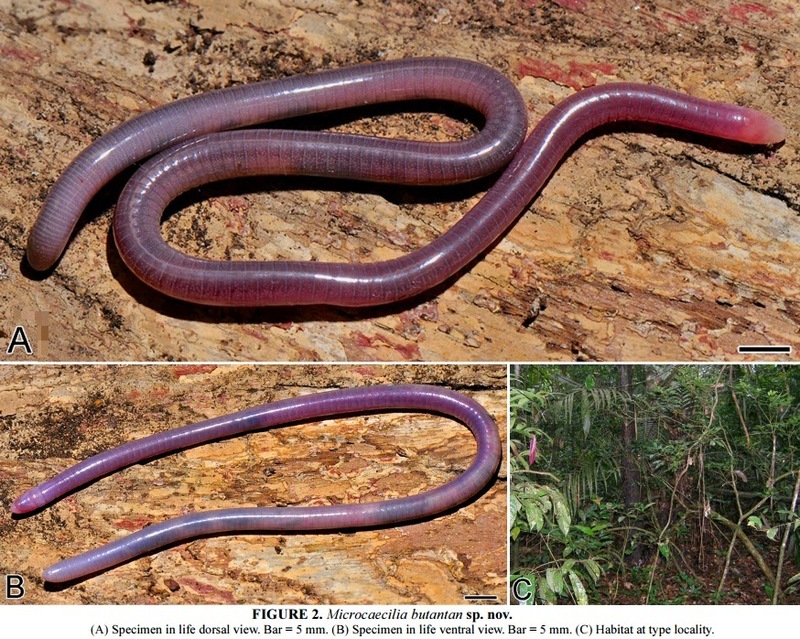 Some specimens were dug from soil in a cupuaçu (Theobroma grandiflorum) plantation suggesting that this form of agriculture provides an environment suitable for at least some caecilians. FIGURE 2. Microcaecilia butantan sp. nov.
(A) Specimen in life dorsal view. Bar = 5 mm. (B) Specimen in life ventral view. Bar = 5 mm. (C) Habitat at type locality. Etymology. The specific epithet is in honour of the Instituto Butantan, which enabled the discovery of the species through the Butantan na Amazônia (Butantan in Amazon) project. To promote stability the species epithet is considered to be noun in apposition for nomenclatural purposes. Suggested English name. Butantan microcaecilia. Wilkinson, Mark, Marta M. Antoniazzi & Carlos Jared. 2015. 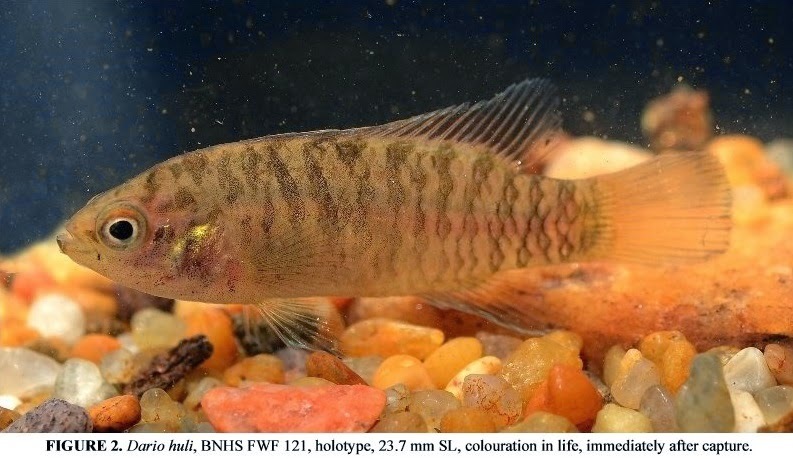 A New Species of Microcaecilia Taylor 1968 (Amphibia: Gymnophiona: Siphonopidae) from Brazil.